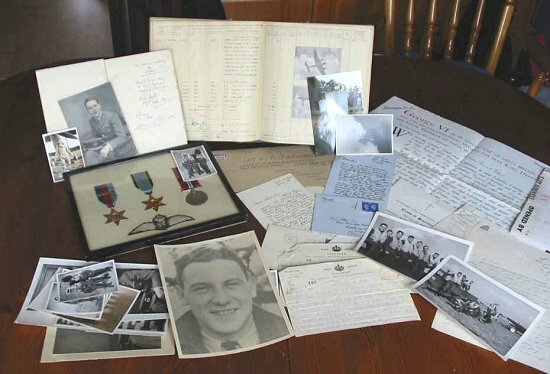 A "RARE" collection of Battle of Britain Memorabilia. 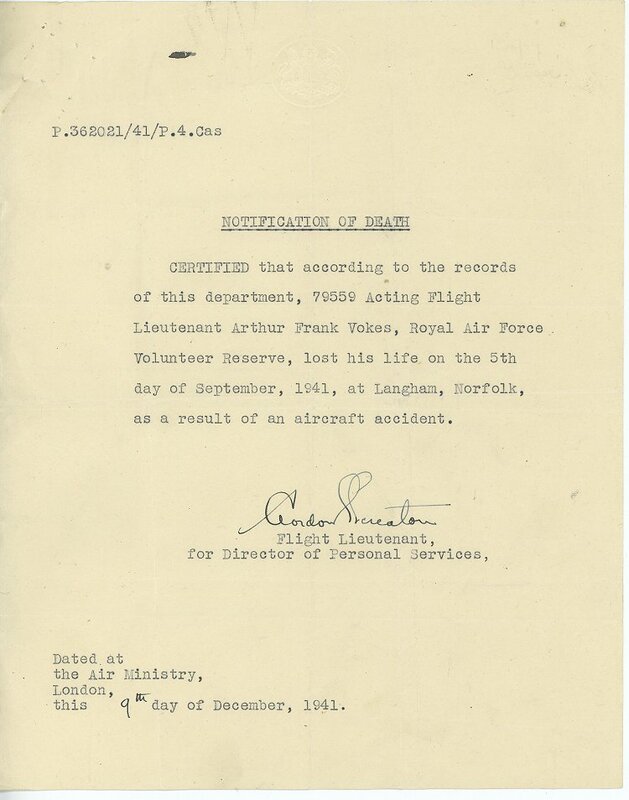 commission and many other documents of Flight Lieutenant Arthur Frank Vokes. 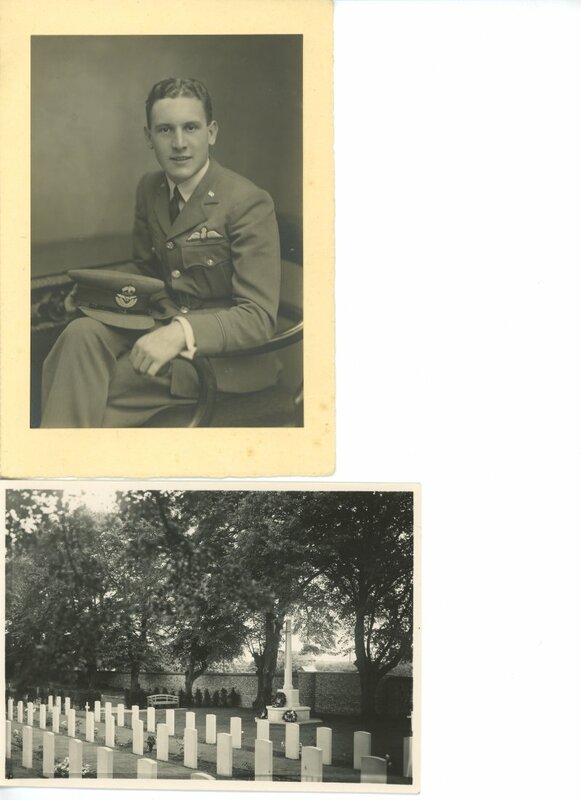 commander of 'A' Flight, in 1941, and flew on the offensive operations of that year. in low visibility. 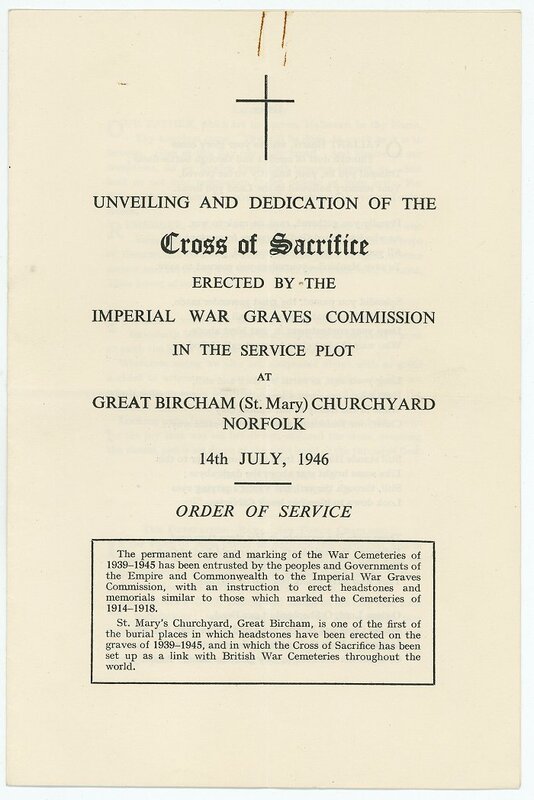 He was buried at Bircham Newton, Norfolk, where his grave can be seen today. Brinsden. 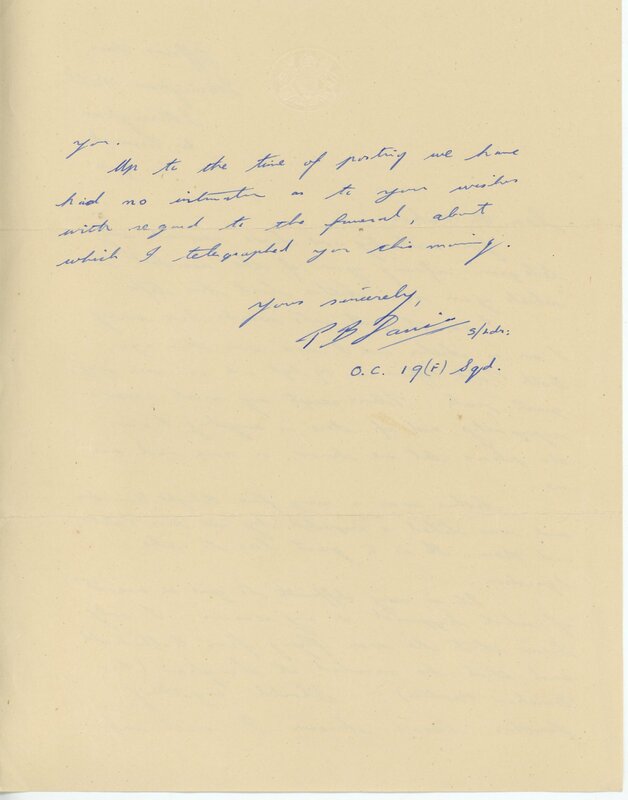 Arthur Vokes is mentioned many times in the book. 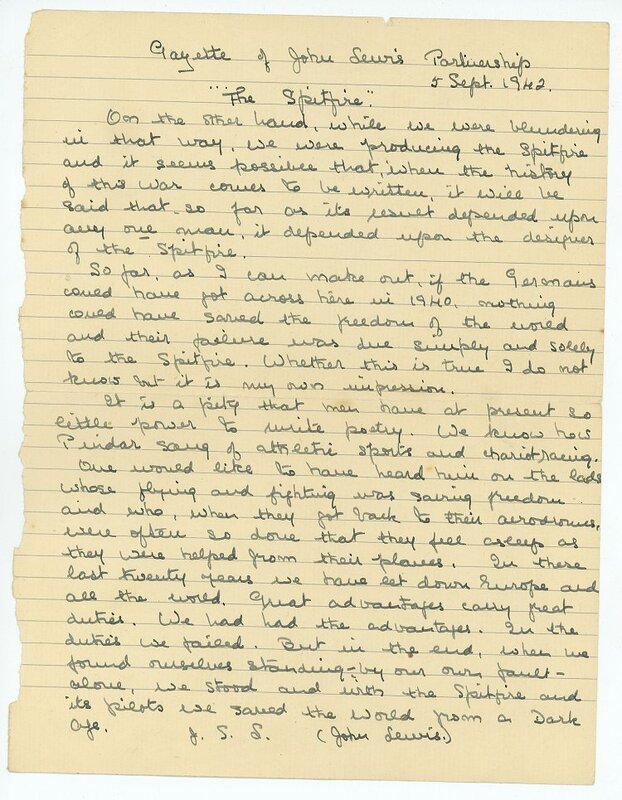 Vokes mother in 1942 added some notes regarding the book and a poem "The Spitfire". 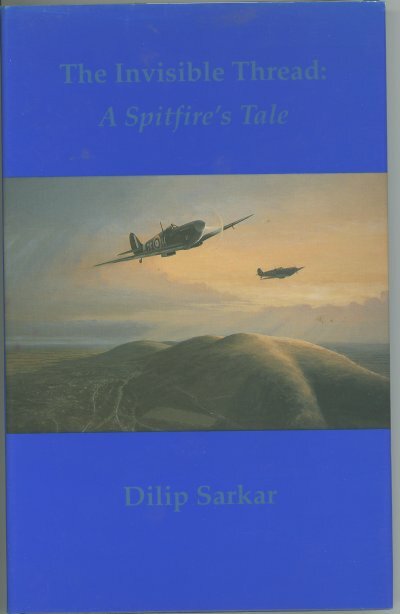 19 squadron personnel in the book Spitfire. detail, photographs and humorous cartoons. exhibition at Lambeth, 'Spitfire Summer'. 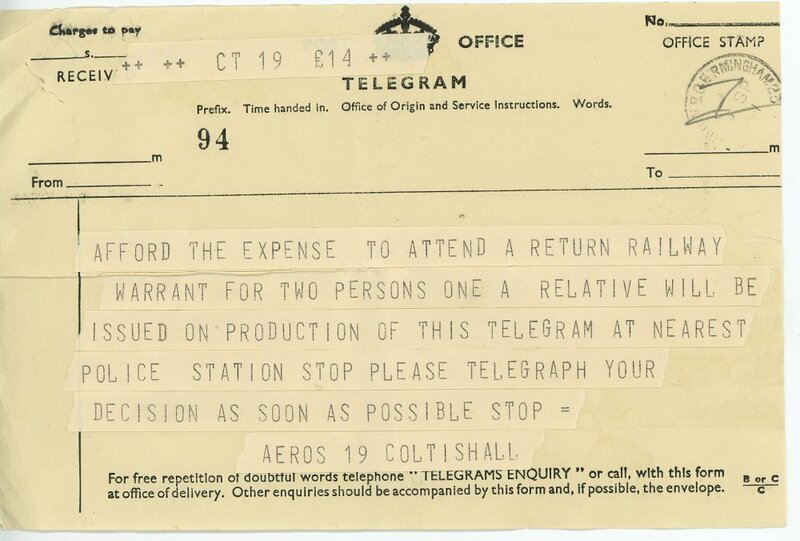 Telegram notifying family of Vokes death September 6, 1941. 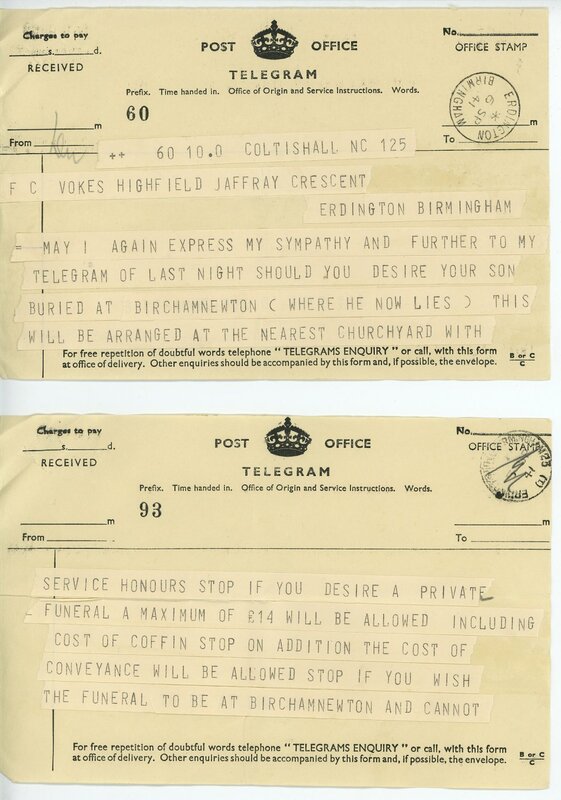 Vokes was born at Erdington, Birmingham, in 1917, the son of a civil engineer. 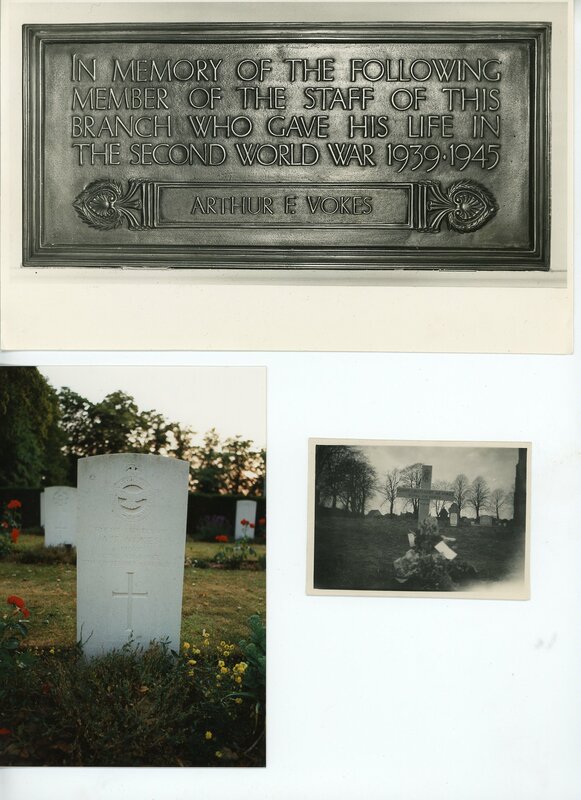 Before the war he worked for a local bank, and in 1938 joined the RAF VR. 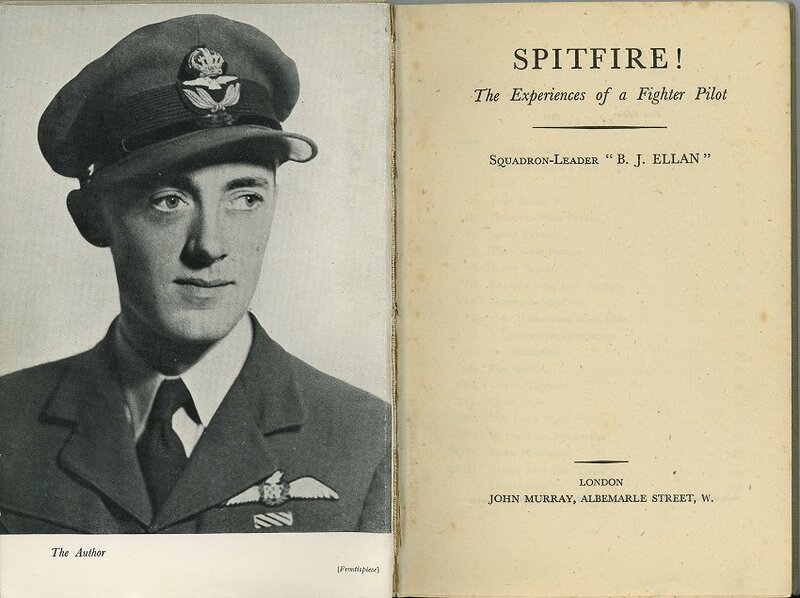 Having learned to fly at No 6 EFTS Sywell, his elementary and service flying training was completed on August 31st, 1939. 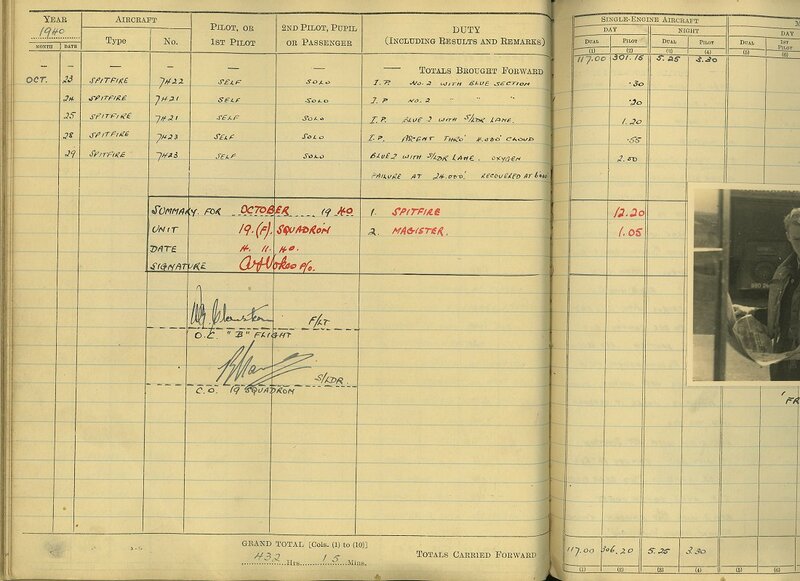 On September 11th, he commenced a flying instructor’s course, but, having been called up for full time service on October 18th, reported to ITW Cambridge, remaining there until October 24th. 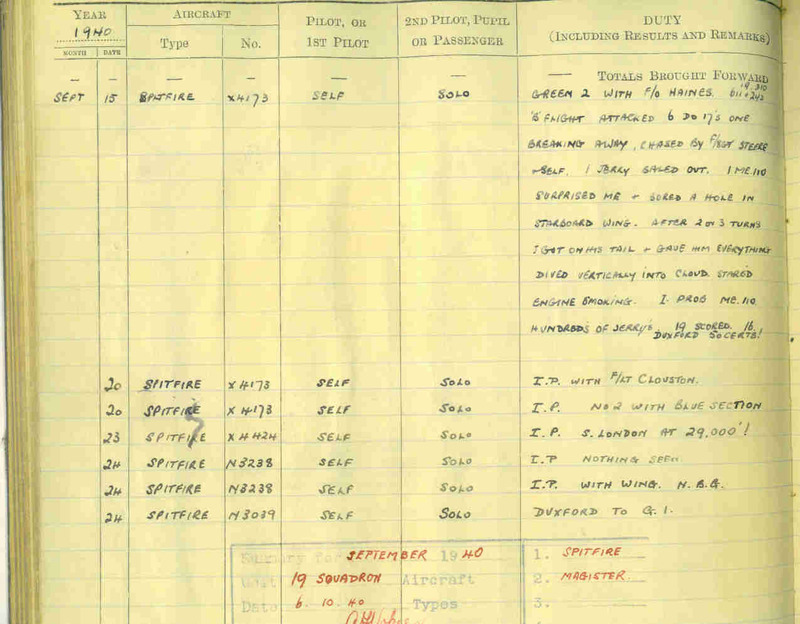 On November 18th, he arrived at No 15 FTS, Lossiemouth, to fly Harvards. 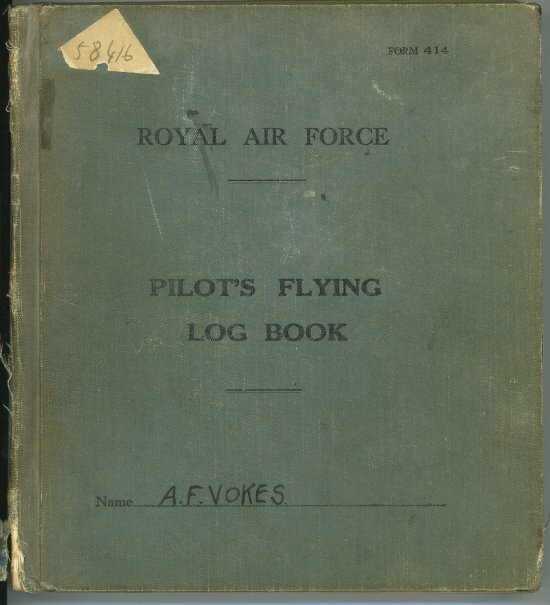 Remaining there for the winter, April and May 1940 saw Vokes receive instruction at 8 FTS Montrose where he received a rating of ‘above average’. 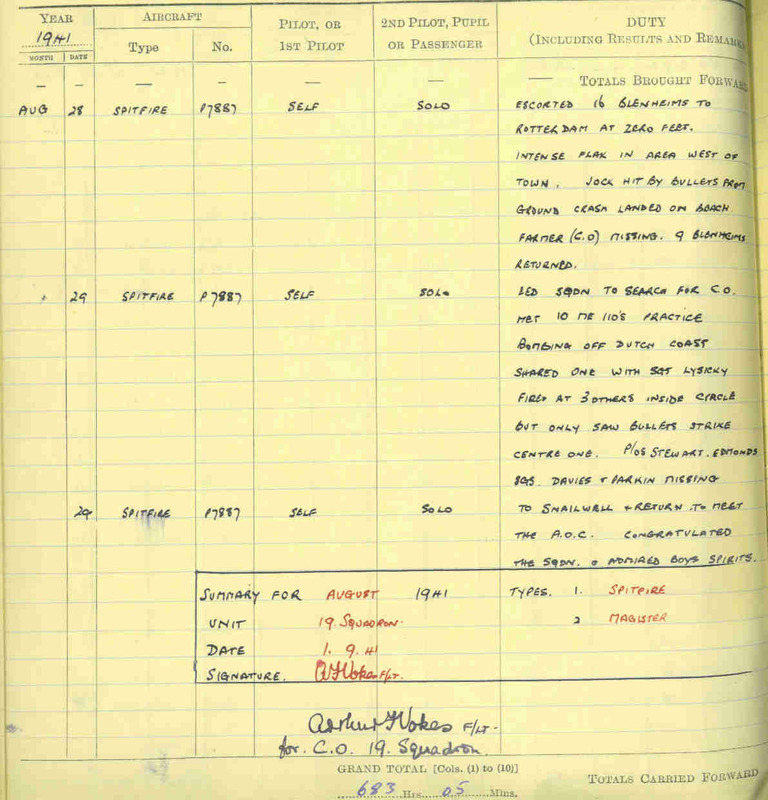 On June 1st he reported to No 1 School of Army Co-operation at Old Sarum, flying Hector and Lysander aircraft. 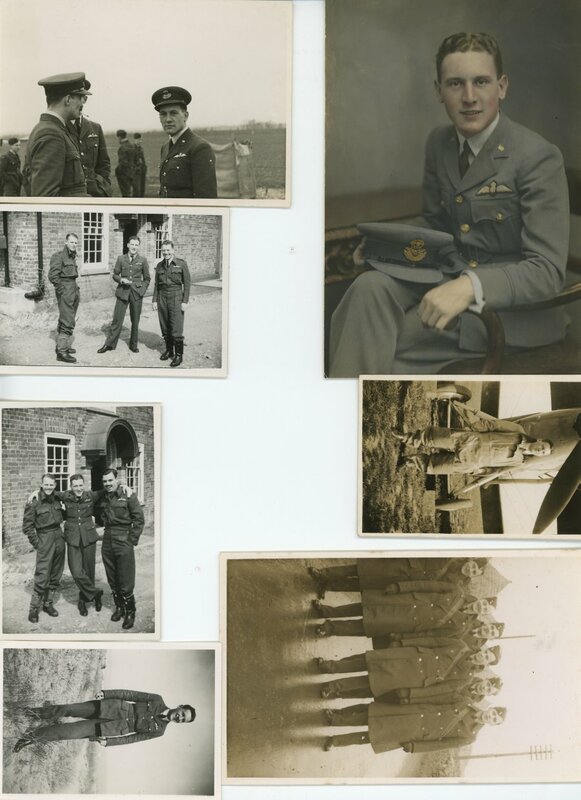 Vokes then volunteered for RAF Fighter Command, subsequently learning to fly Spitfires at No 5 OTU, Aston Down. 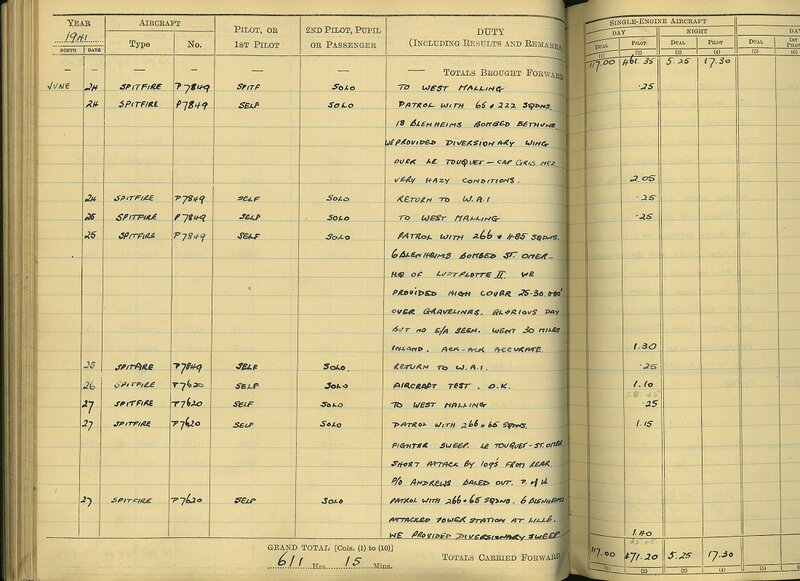 On June 22nd, Pilot Officer Vokes reported to 19 Squadron at Duxford (Fowlmere). 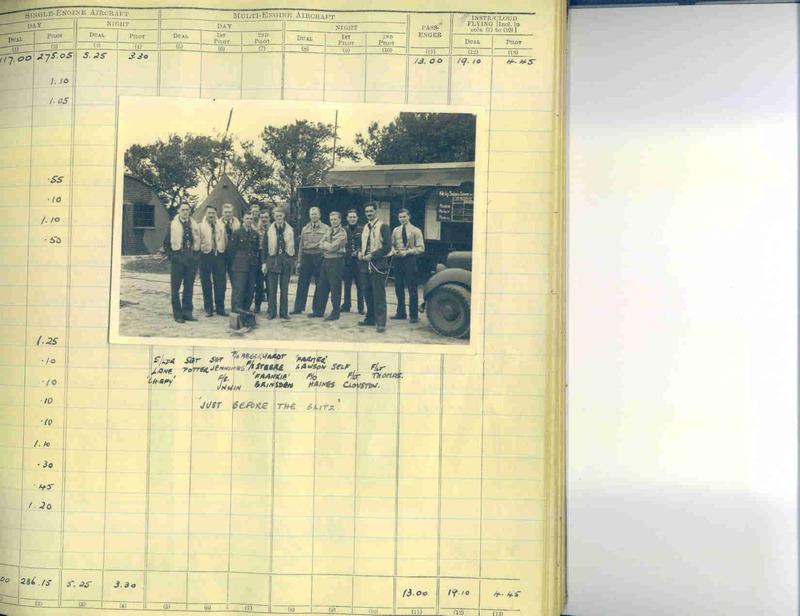 This unit was the first in the service to receive the Spitfire, and had already seen action during Operation DYNAMO. 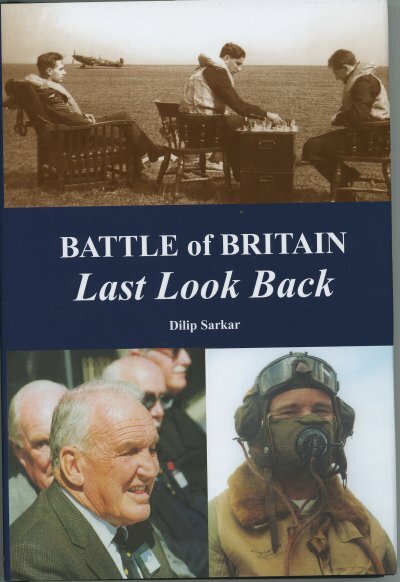 The CO at this time was Squadron Leader Phillip Pinkham AFC, and the Squadron included such notables as Flight Lieutenant Brian Lane DFC and Flight Sergeant George ‘Grumpy’ Unwin. 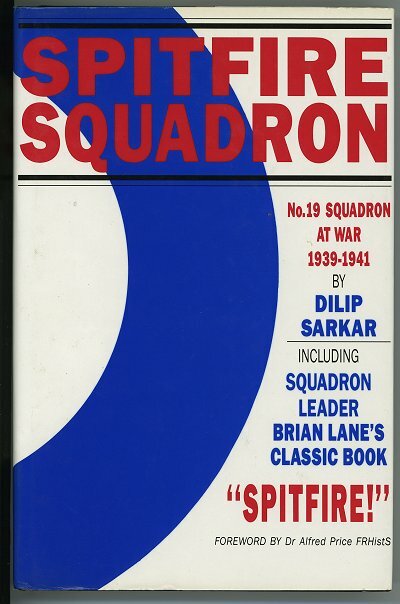 At this time the Squadron was equipped with the experimental Spitfire Mk IB, which was armed with two 20mm Hispano-Suiza cannon. 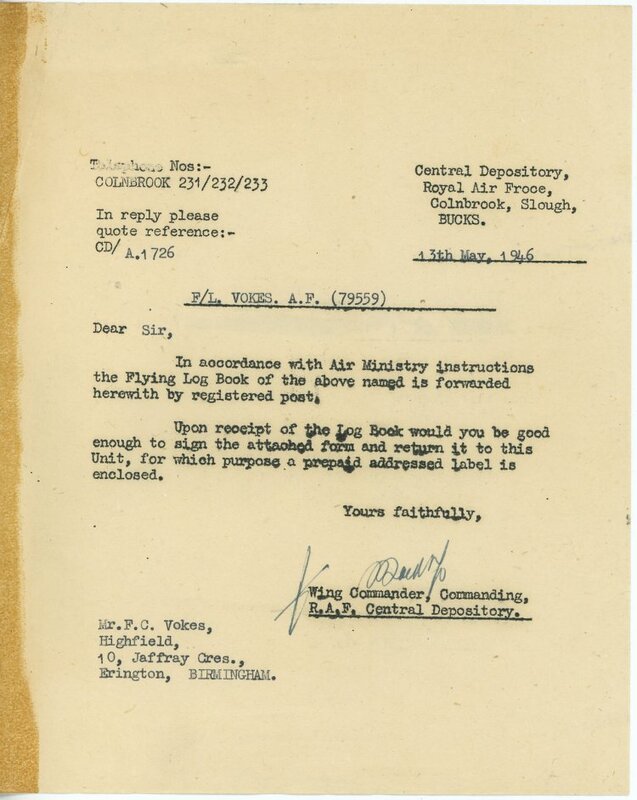 So troublesome would these prove, however, that the unit later swapped the IBs for machine-gun armed Mk IAs. 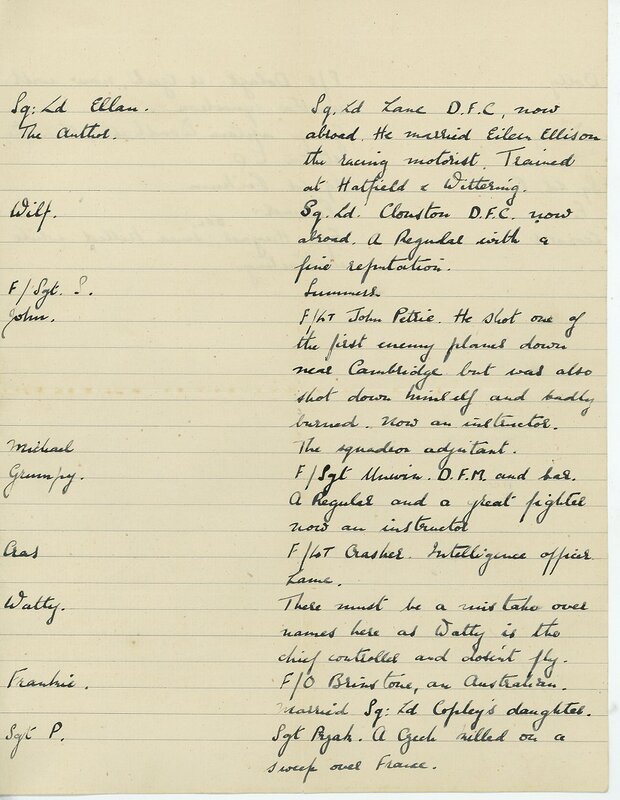 Vokes flew with ‘A’ Flight, led by Flight Lieutenant Lane, and was flying on August 13th when Duxford was heavily bombed. 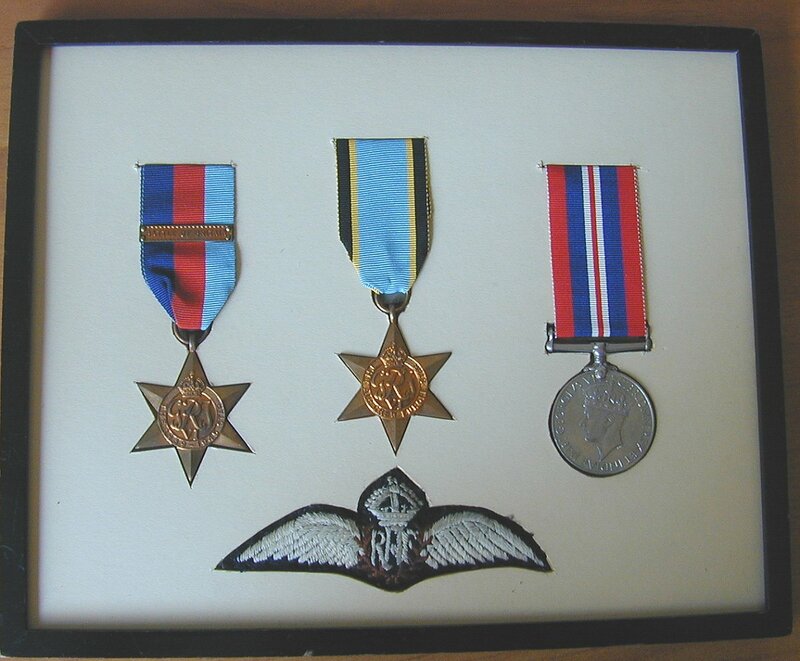 He also flew on August 18th, the so-called ‘Hardest Day’, and on August 31st, the day of Fighter Command’s heaviest losses, he was with 19 Squadron when a large German formation was intercepted near base. 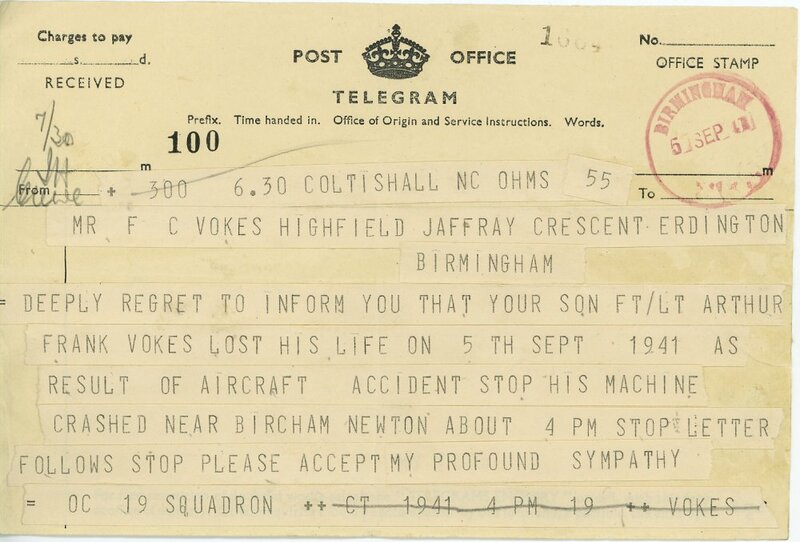 On September 5th he chased an Me 110 out to sea, but without conclusive result, that being the day on which Pinkham was killed in action. 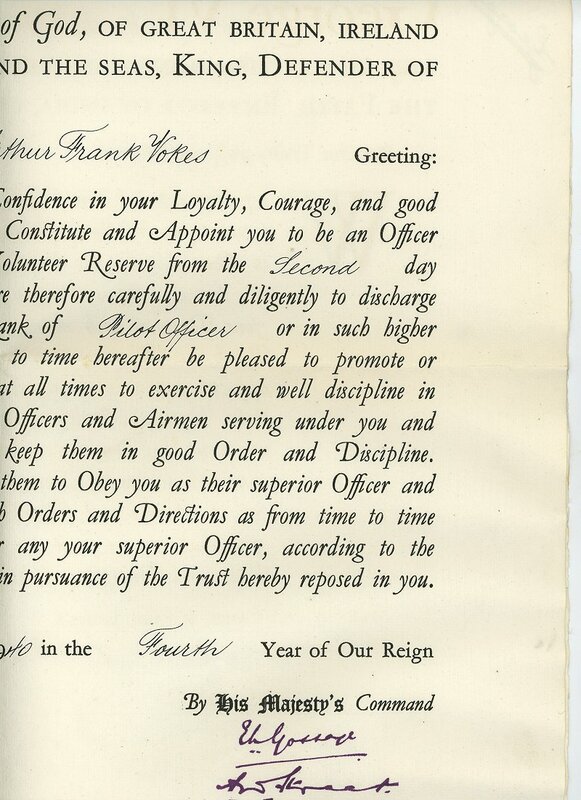 Command then passed to Lane, Vokes’s flight commander becoming Flight Lieutenant Walter ‘Farmer’ Lawson. 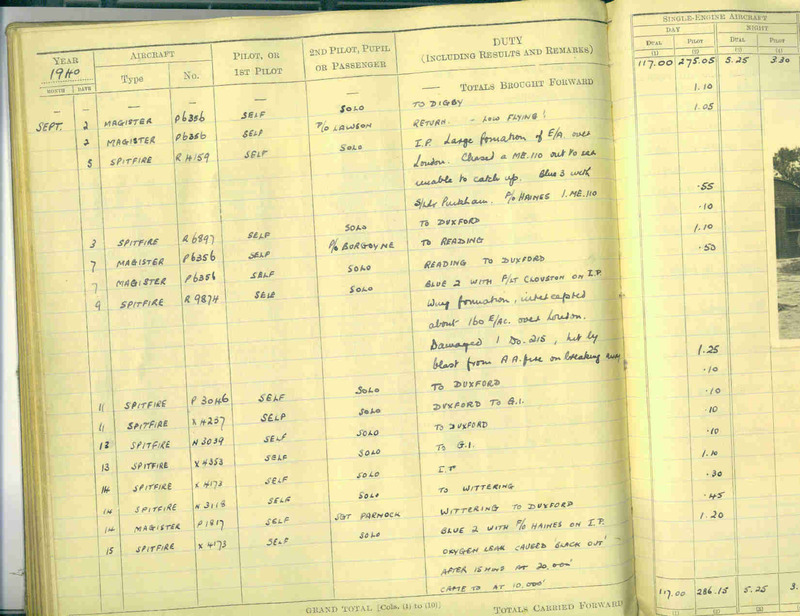 On September 7th, 19 Squadron flew top cover to two Hurricane squadrons, the entire formation being led out of Duxford by Squadron Leader Douglas Bader. 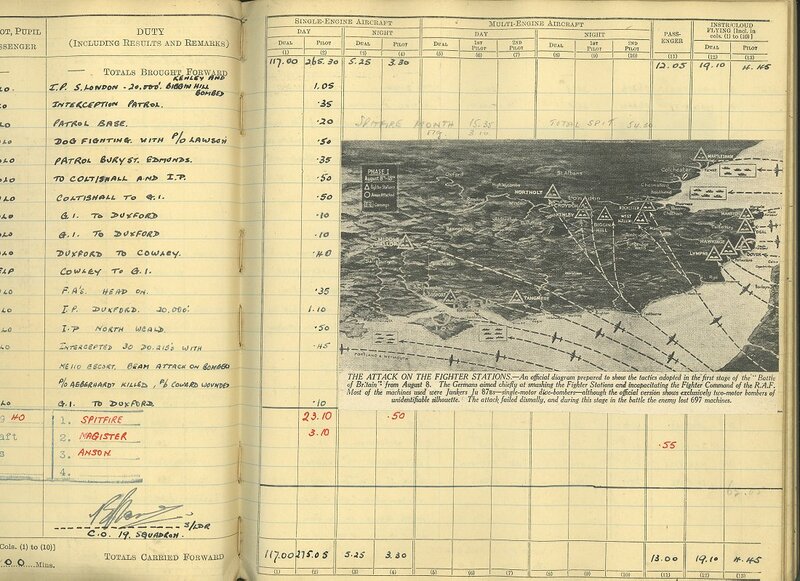 This was, in fact, the first time that the 12 Group ‘Big Wing’ went into action, and the first day on which the Germans started round-the-clock bombing of London. 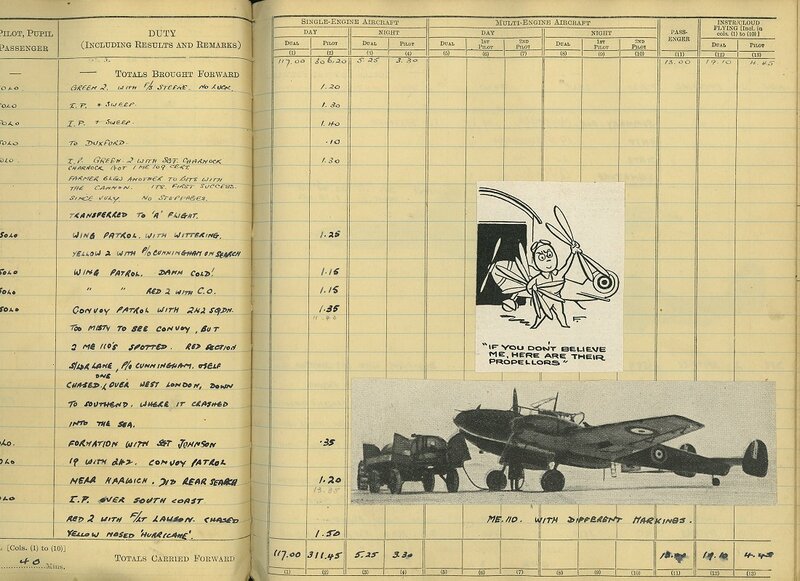 On September 9th, Vokes was in the ‘Big Wing’ formation over London and claimed a damaged Do 215. 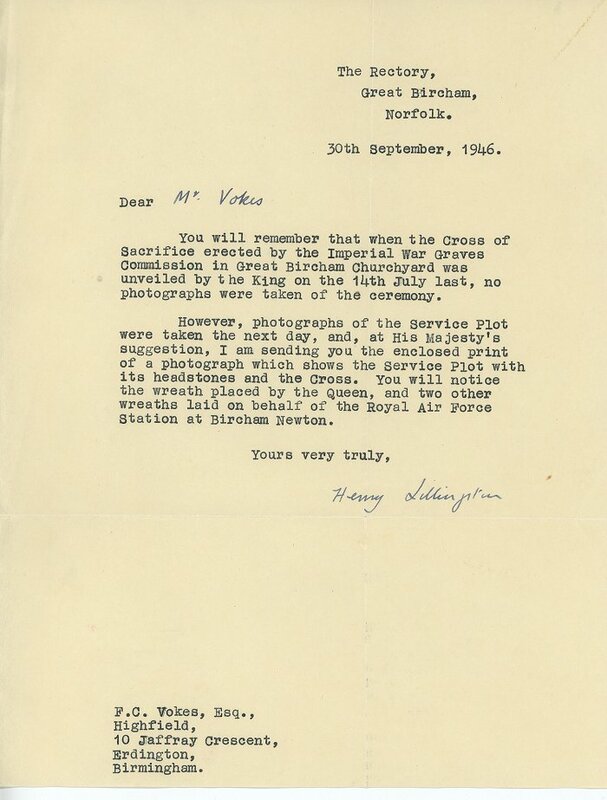 He also flew on September 15th, later recognised as the battle’s climax and a date celebrated annually as ‘Battle of Britain Day’. 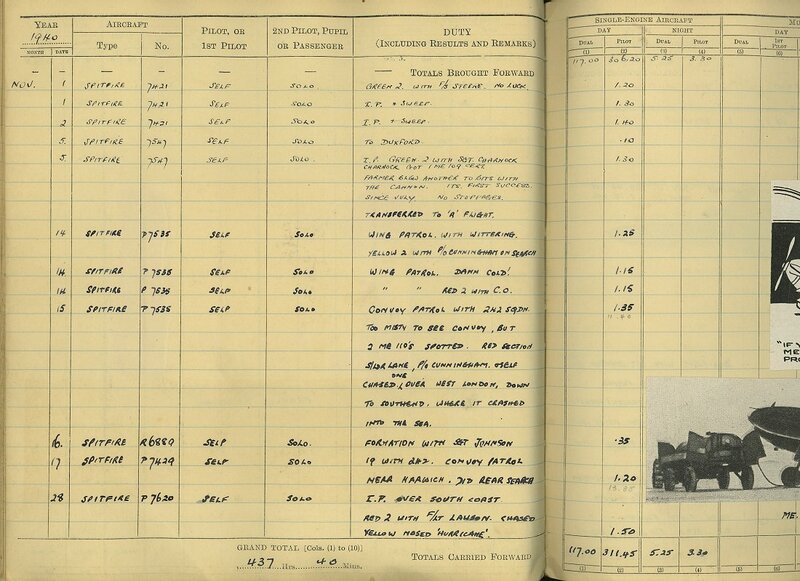 Although Vokes’s Spitfire was damaged he claimed a probably destroyed Me 110. 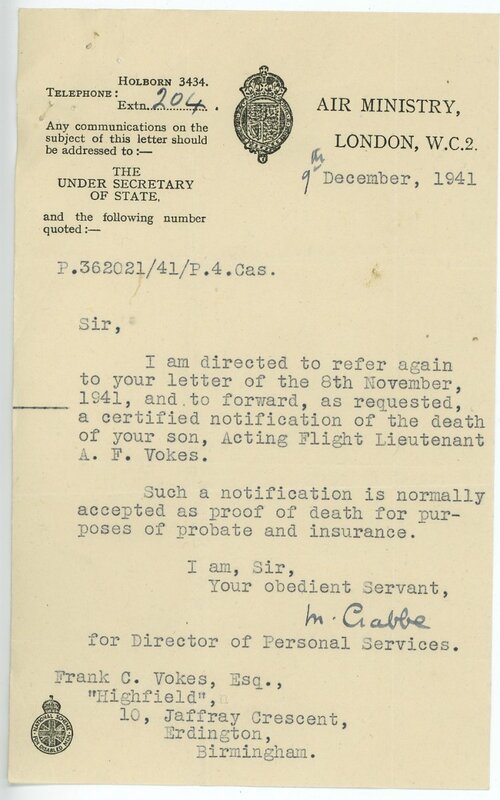 On November 5th, he was flying with Flight Sergeant Steere DFM, who got a ‘109 cert’, and Flight Lieutenant Lawson DFC who ‘blew another to bits with the cannon’. 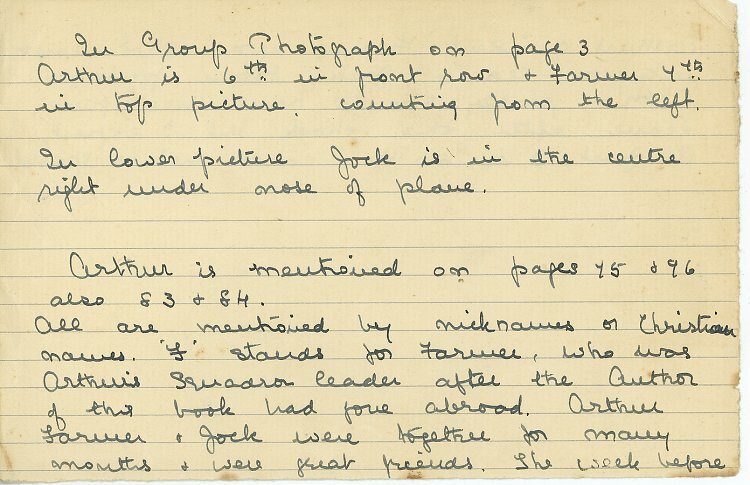 On November 15th, Vokes’s section, comprising the CO, Squadron Leader Lane, and Flight Lieutenant Wallace ‘Jock’ Cunningham DFC, chased out over the sea and destroyed an Me 110. 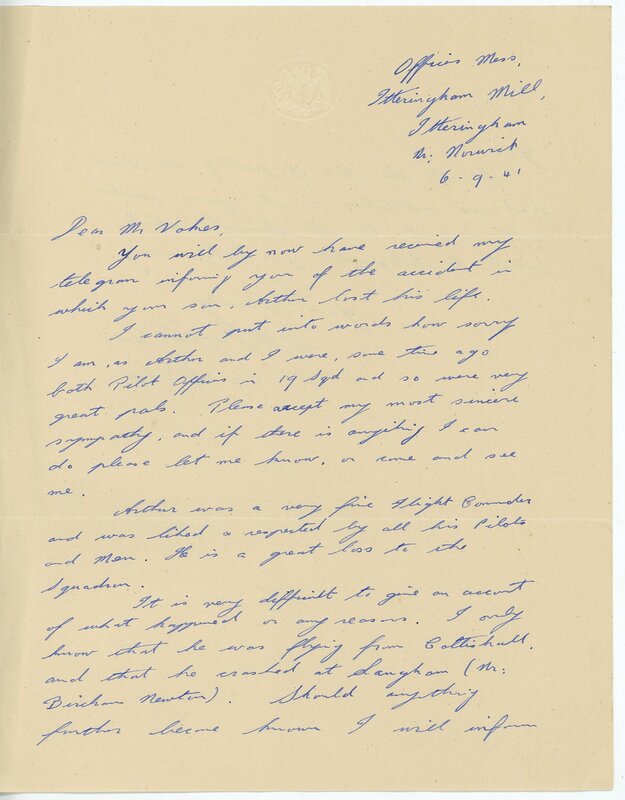 During the winter of 1940/41, whilst the blitz raged, Vokes made a number of nocturnal patrols on ‘Fighter Nights’, but without success. 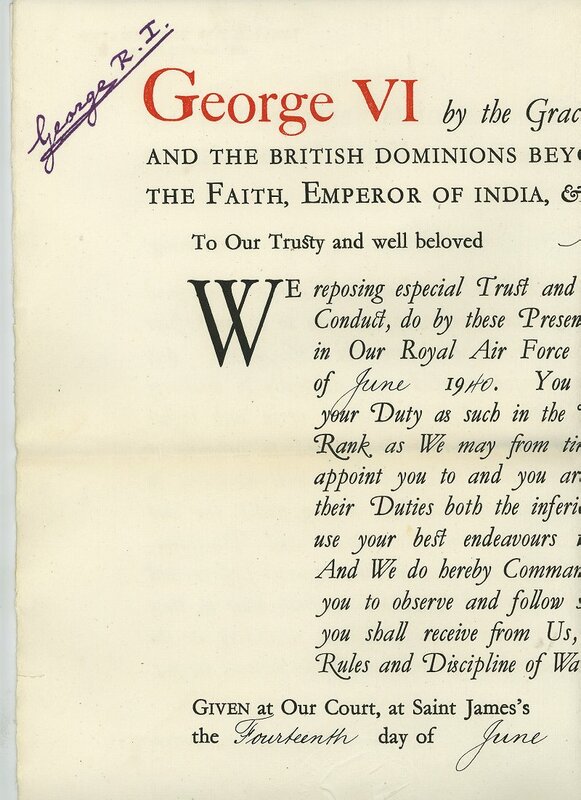 On June 20th, 1941, Squadron Leader Lane was rested, and command passed to Lawson. 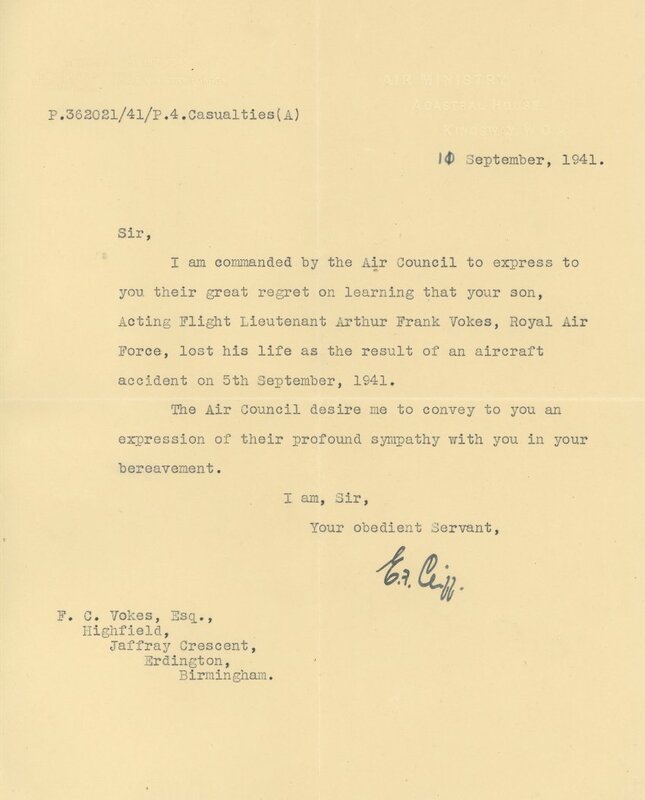 Vokes succeeded him as commander of ‘B’ Flight, and Cunningham became ‘A’ Flight commander. 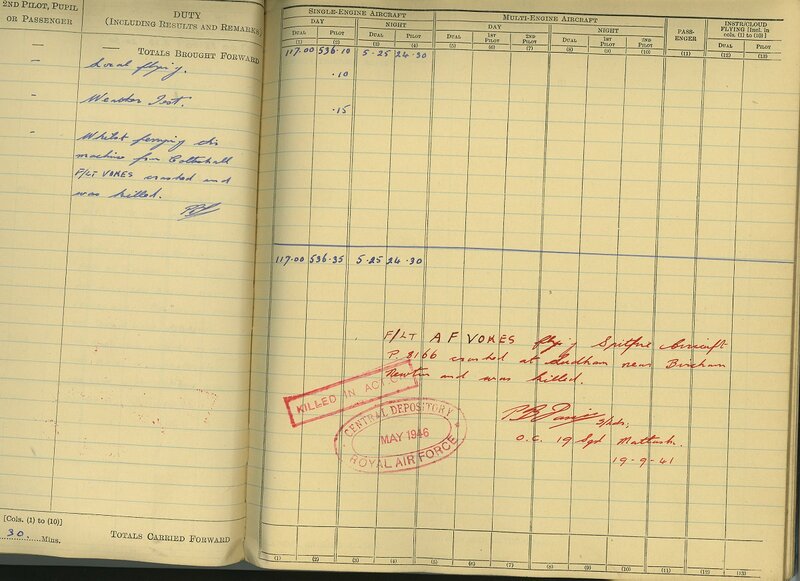 The Squadron participated in the ‘Non-Stop Offensive’ of 1941, Vokes flying on a ‘Circus’ to Lille on June 27th, when he damaged an Me 109. 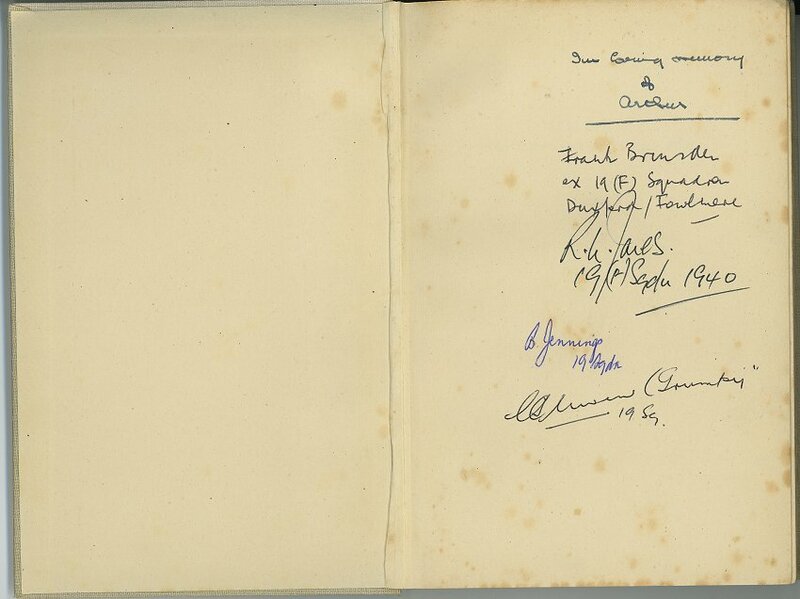 On August 28th, 19 Squadron escorted Blenheims to attack enemy shipping off Rotterdam. 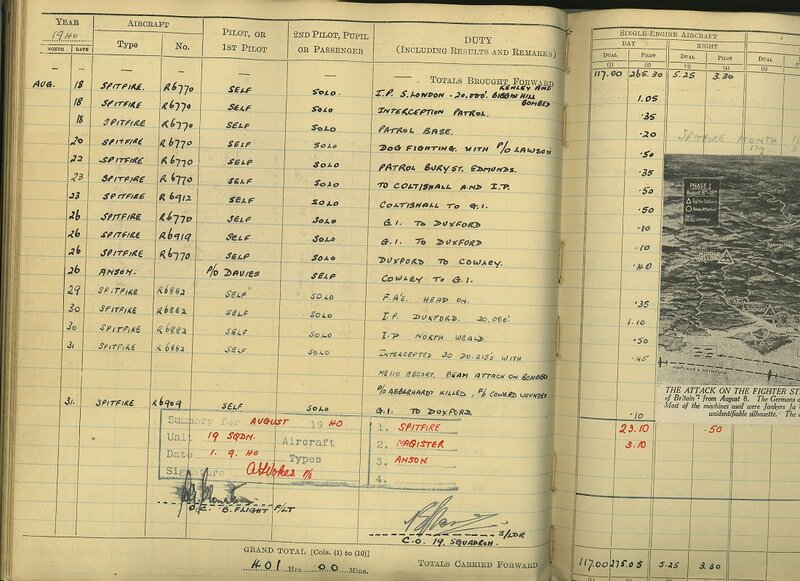 The operation was a disaster: Lawson was shot down by an Me 109 over the North Sea and remains ‘Missing’, and Cunningham, hit by light flak, forced landed on a beach and was captured. 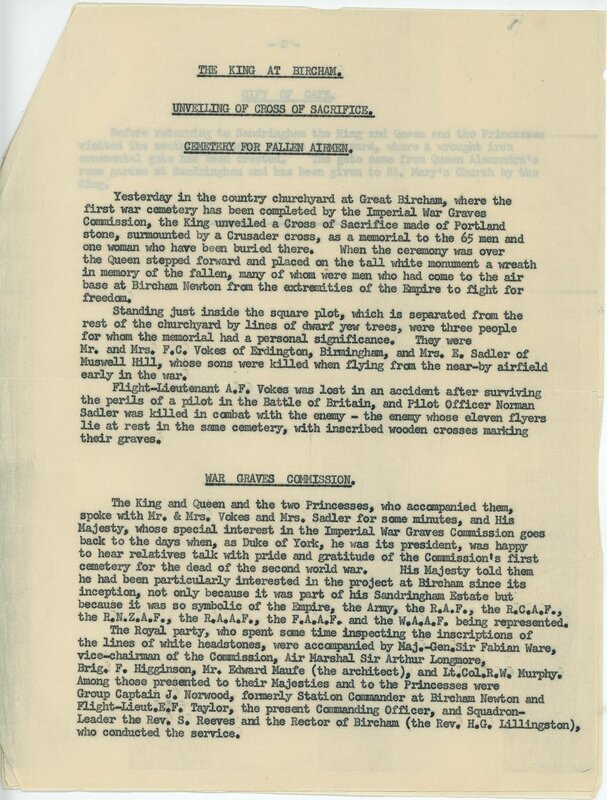 Vokes then became Acting CO and, the following day, led the Squadron on an ASR for the two missing pilots, both close personal friends of his. 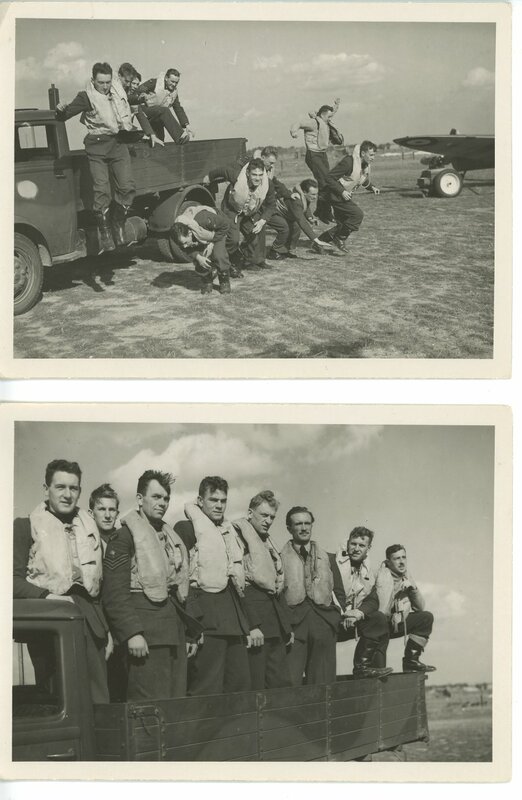 Unfortunately the Spitfires ran into a large formation of Me 110s practise bombing over the North Sea, and came off second best in the ensuing combat. 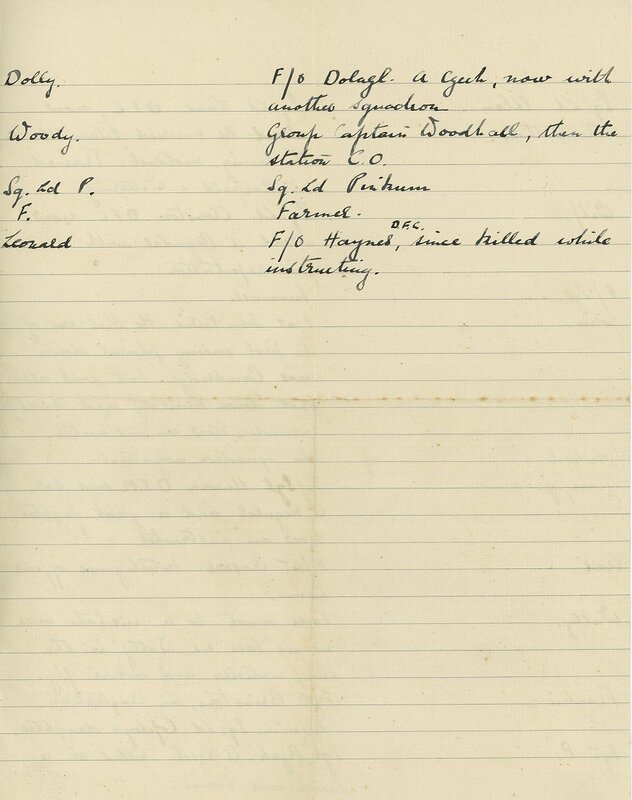 From the sortie, four Spitfire pilots failed to return. 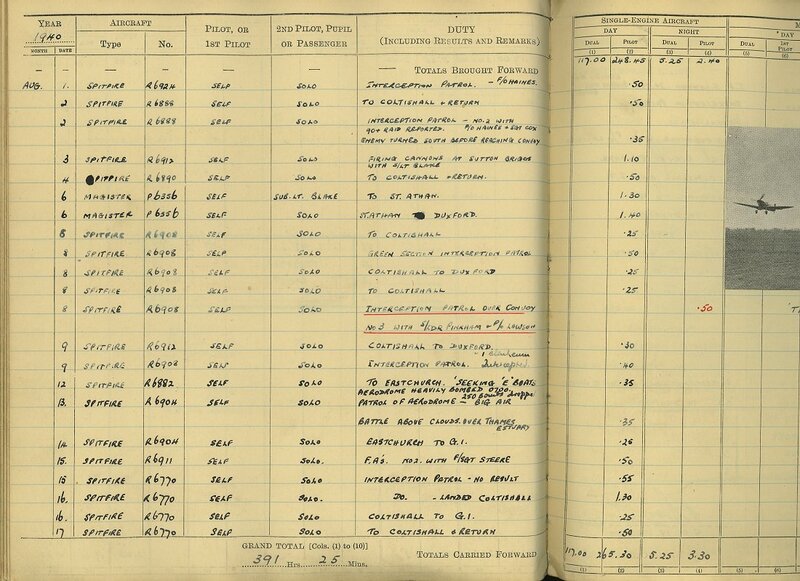 A week later, the Squadron now based at Matlask in Norfolk, Vokes ignored advice and took off in low cloud and nil visibility to ferry a Spitfire, P8166, from Coltishall back to Matlask. Unfortunately he descended through cloud at too steep an angle and crashed near Langham aerodrome. The 24-year old was killed instantly.